Kpreps.com would like to congratulate Susan Goodwyn for submitting the winning photograph for Week 3 of the Kpreps Friday Night Photo Contest. 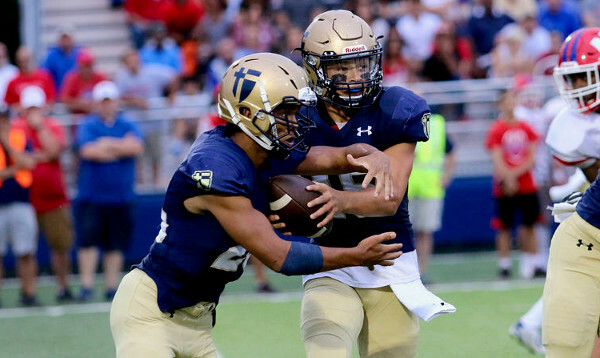 Susan’s photo captures the mesh point on a read play between St. Thomas Aquinas quarterback Will Swanson and running back Cameron Jackson. The Saints fell 27-14 to Bishop Miege in last week’s showdown of the top ranked teams in Class 5A and Class 4A-I. For this winning photograph, Susan is now eligible for our 2017 Grand Prize including $500 in cash. Each week during the regular season and playoffs, Kpreps will select a winning photograph that will become eligible to win the grand prize. This means there will be 13 photos chosen as finalists for the 2017 contest. Only weekly winning photographs will be eligible for the grand prize! Weekly winners will be featured on Kpreps.com.